The Local History Collection is housed in the Mary C. Shantz Room on the Research Level of the Main Library. Mary C. Shantz was the head of the reference department at the Sudbury Public Library from 1966 until her retirement in 1984. 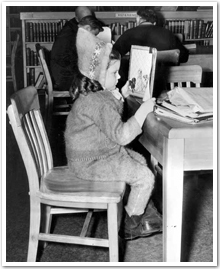 The local history collection exists due to her diligent efforts early on to collect images, reports, books, as well as other local publications. To honour her many contributions, the library decided to name the room that housed the local history collection the "Mary C. Shantz Room" in 1986. Mary Shantz describes the Local History Collection as it was in 1982 in an interview conducted by Gary Peck for the radio program Memories and Music. The interview illustrates just how much the collection has grown in scope and value in the years since then. This collection includes resources of tremendous value to the rich history of Greater Sudbury and, therefore, must be viewed within the Main Library. Some of the books about local history are available for checkout in our regular, circulating collection. The Local History Collection is always adding new material. See what's new in our catalogue. 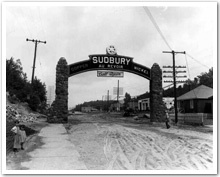 The Local History Collection may be a good starting point for researching your ancestry in the Greater Sudbury region. In addition, the library offers access to other very helpful resources for your research. The Genealogy page has a guide for Getting Started with your research and offers access to several online resources.